Passengers in Sheffield and Rotherham will become the first in the country to use innovative new tram-train vehicles when a trial finally gets underway later this month. The new vehicles, designed to run on both the city's tramlines and the rail network between Sheffield and Rotherham, will begin taking passengers from Thursday October 25. Steve Davenport from SYPTE said: "As project partner we are thrilled, to introduce tram-train services on South Yorkshire's transport network later this month. The pioneering pilot has the ability to transform travel both locally and nationally. Connecting the people and places in Sheffield and Rotherham marks the start of this journey. We hope passengers from the local area and beyond enjoy the benefits this new transport option will provide." The tram-train pilot will run for two years with a view to permanent operation. Customer satisfaction, passenger numbers, reliability and costs will be tested. Three tram-train services are expected to operate per hour but timetables, or the name of the route, have yet to be announced. Tickets will be fully integrated with Stagecoach Supertram. Vehicles will run on the national rail network from Rotherham Parkgate Retail Park via Rotherham Central Station. 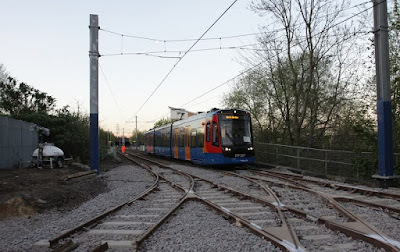 A new 160 metre section of track – called the "Tinsley Chord" - links the tramway to the train line and vehicles will join the existing Stagecoach Supertram network at Meadowhall South and continue to Sheffield Cathedral. The pilot project has come in for scrutiny over cost increases and delays, the under-estimation of the scale and complexity of the works, and the risks involved in delivering new technology. Critising the Government and Network Rail, the Public Accounts Committee said that it had all the makings of a "how not to" seminar for future projects. An earlier report from the National Audit Office (NAO) revealed that by December 2016, the cost of the works for the project, which had been given an initial estimate of £15m, had quadrupled to £75.1m, pushing the overall cost of the scheme over £100m. True to form with this Project a start date has been announced... with no details of timetables, route colour/name, fares... and, at least at Rotherham Central, yet to be finished stops with no name boards/safety fencing installed. Good question John. Senior passes can be used for free off peak travel on buses and trams and for half price travel on trains in South Yorkshire. Will a tram-train count as a tram or a train?! "... the cost of the works for the project, which had been given an initial estimate of £15m, had quadrupled to £75.1m, pushing the overall cost of the scheme over £100m..."
Can anyone explain the maths on this please.